One of the basic building blocks of electronics project is building your own DC power from an AC source of 110 VAC or 220 VAC. The common DC voltages that are required to power up the devices are generally in the range of 3 VDC to 30 VDC. Typically the fixed types of DC voltages are 5V, 9V, 12V, 15V and 18V DC. With the advancement of technology, many devices are using 1.8 V DC these days. SMPS is becoming common these days as the demand for miniaturization due to space constraints increases. Take note that for linear DC power projects, you need to use a step down power transformer to step down the AC voltage from the line voltage of 110 VAC or 220 VAC before using it to supply to the diode bridge. This project uses a LM338 adjustable 3 terminal regulator to supply a current of up to 5A over a variable output voltage of 2V to 25V DC. This project uses a LM318 adjustable 3 terminal regulator to supply a current of up to 1.5A with customized 12V DC Voltage. 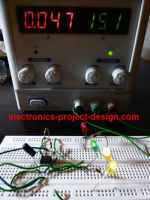 This is a simple DC regulated project using 7805 voltage regulator to obtain a variable DC voltage range from 5V to 15V. Build your own 5-20V DC power using National Semiconductor LM2941 low dropout voltage regulator. Construct a 12 VDC, 120 mA switch mode supply from AC source of 85-265 VAC. This application circuit uses the MCP73853/MCP73855 linear charge management controllers for cost sensitive applications. They are specially designed for USB applications and adhere to all the USB specifications governing the USB power bus.